Kevin, Paul, and Billy in The Young and the Restless spoilers. The Young and the Restless spoilers for Tuesday, April 25th, predict that someone’s life will be changed forever when he becomes an insta-father! Congratulations–It’s a Girl! But Whose? Kevin (Greg Rikaart) and Billy (Jason Thompson) got the shock of a lifetime when they read letters from Chloe (Elizabeth Hendrickson) telling them that one of them could be there father of Bella! Who do you think it is, dear Soap Cities readers? 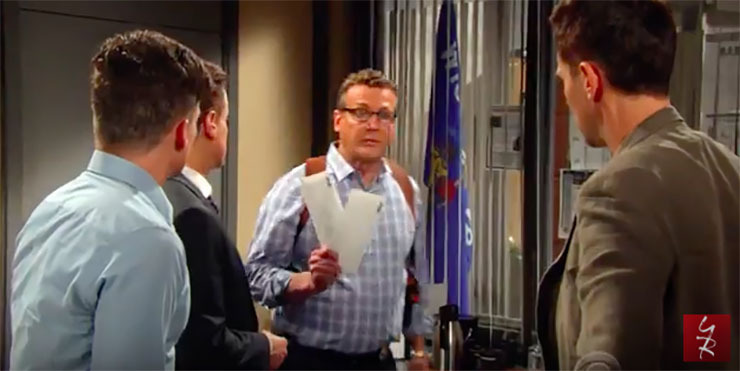 Tuesday, Paul (Doug Davidson) gives each of them another piece of paper that will change their lives. A soap classic: the paternity test result! Meanwhile, Lauren (Tracey Bregman) is surprised when Scott (Daniel Hall) tells her he’s lonely. Then he asks her to set him up with one of her friends! Hmmm…last time we checked getting busy with one woman, then going on a date with another didn’t count as lonely. Besides, Scott is a total package: handsome, intelligent, kind, socially conscious. He wouldn’t have trouble finding a perfect partner in Genoa City. Jack (Peter Bergman) gets serious with Abby (Melissa Ordway). He tells her he’s not signing anything until she tells him what’s really going on. She looks nervous, and frankly, in over her head. Will she continue in this alliance with Jack, given that if Victor (Eric Braeden) found out, he would be chagrinned, to say the least?After all, the Newman patriarch could take away as easily as he giveth! Oh, Abby–what are you getting yourself into?! Previous ArticleDays Poll: Do You Prefer OG or Nu Abby…Could the OG Be Coming Back?